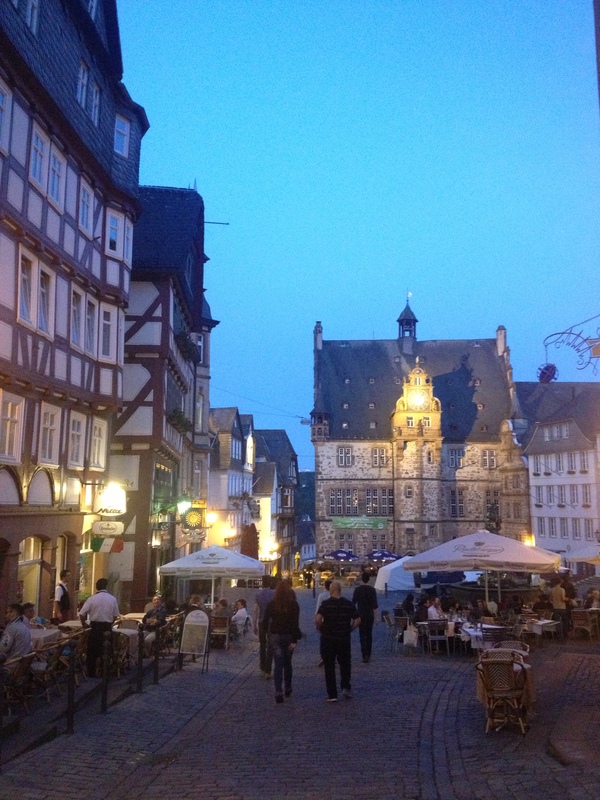 Downtown Marburg in the evening. My current city is the German town of Marburg. 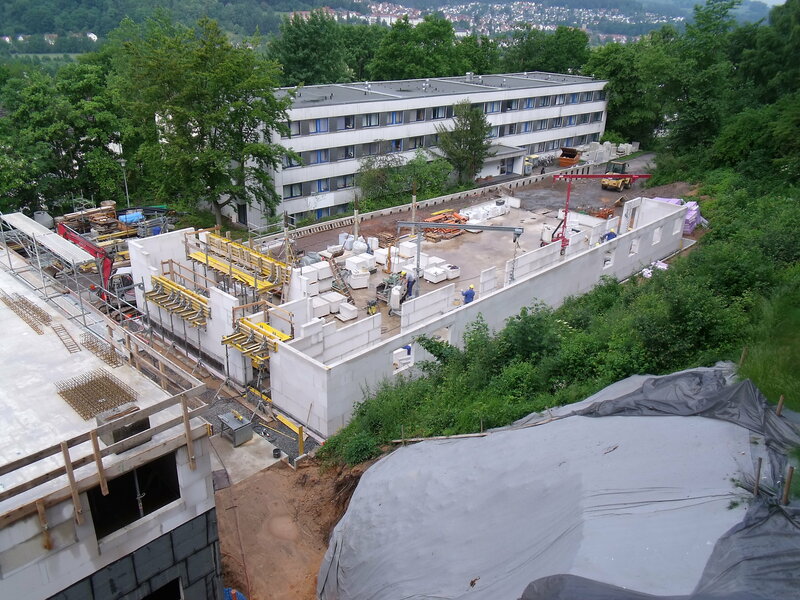 I have a dorm room in Studentdorf which is one of the two main housing areas for students. Somehow I lucked into one of the rare rooms that has a complete bathroom and kitchen along with a balcony. The other rooms use a communal bathroom and kitchen with no balcony. So I’m content and happy. After flying nearly 5,800 miles to be on vacation, I walk out on my balcony to a construction site right below me. It’s ironic. I left 3 construction sites back in SoCal, only to have one right beneath me way over in Europe. But I’m actually kind of happy. I get to see if the Germans are as good of workers as my guys are. The construction site right beneath my room. Marburg is old. Really old. 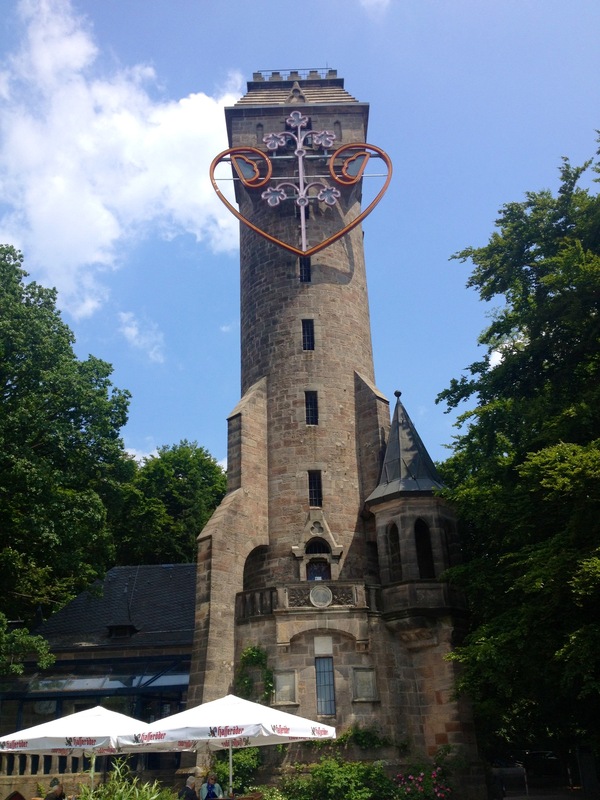 My friends are studying at the University of Marburg which is the oldest Protestant-founded university in the world. Founded in the 1527, the old university building looks like part castle and part Gothic church. I wish my nationally acclaimed Riverside City College looked nearly as spectacular. The Oberstadt is the shopping, eating, and bar center. There are cobblestone walkways, weathered statues in the intersection of the narrow streets, and tall gabled brick buildings. The food here is outstanding and incredibly fattening. Each morning, I take a 5-minute walk through the woods to catch a bus into town. The ride to the local bakery is short, and I’ll grab a coffee and a chocolate croissant. My favorite dish so far is a chicken casserole called Auflauf. It’s a heavenly combination of noodles, chicken, and a mystical sauce. If you’re classy, you’ll drink a tall glass of Aepfelwein which is an apple ale. That’s a great dinner. Night life out here doesn’t begin until 11pm. Most bars and clubs don’t even open until 10:30pm and the partying doesn’t start until midnight. These Germans are stone-cold serious about their drinking. If the party doesn’t last until at least 5am, it was a fail. I just look on in jealous amazement at their alcohol tolerance. I have just enough common sense to avoid trying to keep up with them. 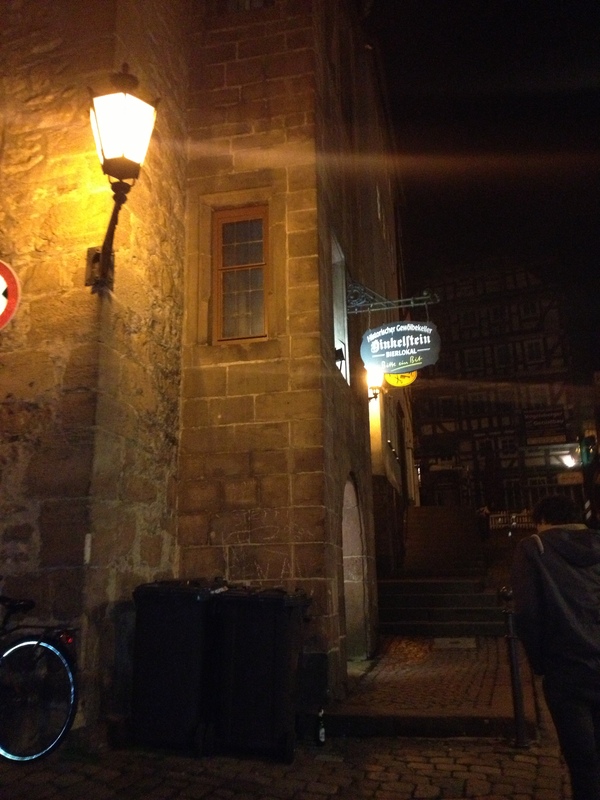 Last night, our group met up at Delirium (an excellent bar name) to give me a Marburg shot. It’s a ritual around here that when a new person arrives, they are initiated and welcomed with a Marburg shot. I walked in and greeted my friends. The guys asked me if I was ready for a fruity shot. And I was. Thank God for my new friend Kelsey. She had just been initiated and whispered to me, “You might want to grab a beer for a chaser”. But no time, next thing I know, shot glasses were raised and then it was all fire. Fruity was the furthest thing from the truth. It was like pure alcohol with crushed habaneros. I lasted for about 30-seconds without a chaser, then pride was gone and Kelsey handed me her beer. That was my welcome to Marburg. Very unforgettable. After an hour at Delirium, our group headed over to a bar called Hinklesteinan that once served as a bunker in WW2. There’s a long staircase down to two open and domed rooms. Here the walls were made of huge rocks and it had a damp underground feel to it. On a nearby hill, stands the Rapunzel Tower. Yes, the one the Grimm brothers saw and used as inspiration for the famous fairy tale. There’s a long walk along a wooded path to get to the edge of the mountain where the tower is. The view from the edge of the mountain is quite worth the tick and bug infested walk. 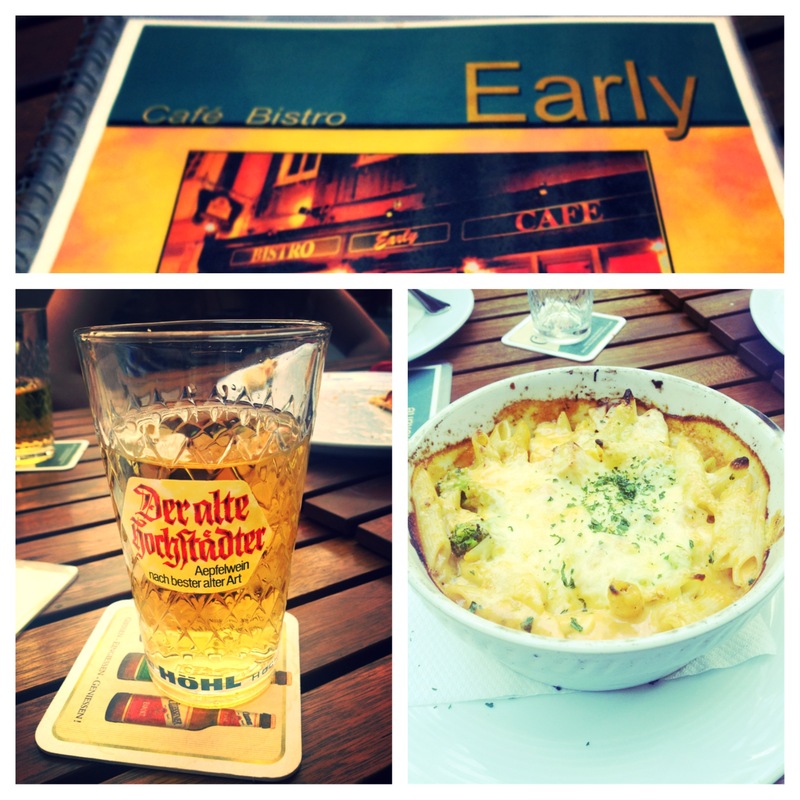 I think it is needless to state that I love it here in Marburg. Every single day, I see a new part of the town, another impressive building, or another breathtaking view. It is impossible to miss SoCal right now. The thought of the heat, the smoggy air, or traffic-congested freeways makes me appreciate the relaxing and slow-paced life here.